As a mom to a toddler, one of my ongoing goals is to get her to eat a diet that is (relatively) balanced + healthy(ish). While she doesn’t hate vegetables, like many children, she prefers to fill up on the other stuff, + sometimes leaves the veggies behind. So, I figured a good way to squeeze a few more veggies into her diet was to mix them into meals that she already loves. Namely, macaroni + cheese! 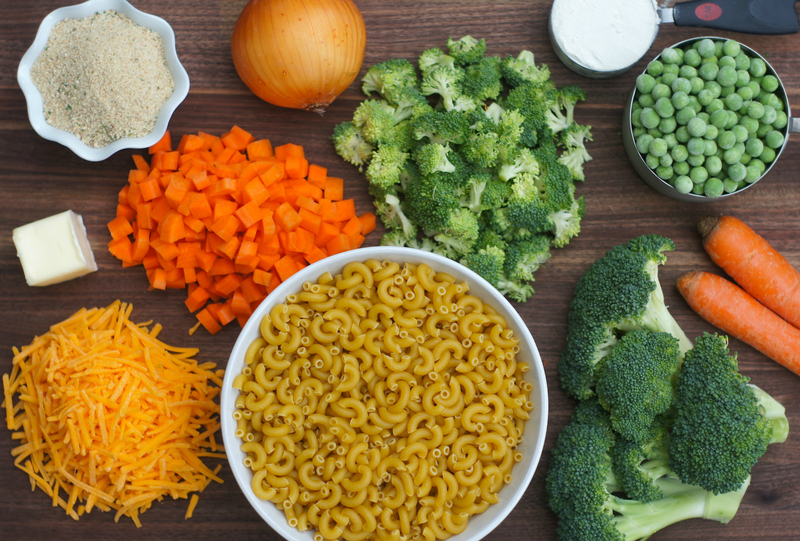 In this recipe, I cook the carrots, peas, + broccoli right in the water with the pasta, then toss everything with a homemade cheddar sauce, top it with some seasoned bread crumbs, + bake it until golden and bubbly. Mmmmm. And how is it? Truly wonderful! This is one of those dishes that gets gobbled up by both the children at the table AND the adults. It’s rich enough for the adult palate, while familiar enough to be appealing to little ones, too. While my little girl loves this as her main dish, I prefer it as a side dish, alongside turkey burgers, grilled chicken, or meatloaf. And while I chose to use her three favorite vegetables – peas, carrots, + broccoli – you can get creative and substitute whatever veggies are the most popular in your household. However you make it, and whatever you serve it with, I’m confident that you + your family will love this mac and cheese! Preheat the oven to 350 degrees F. Butter a 9×13 baking dish (or lightly spray with cooking spray). Bring a large pot of salted water to a boil. When it’s boiling, add in the pasta and diced carrots, and set your timer to however long it takes to cook your pasta al dente. For me, that was 8 minutes. Cook, stirring occasionally, until your timer has FOUR MINUTES left. Add in the broccoli. Continue cooking, stirring occasionally, until the pasta is al dente. Remove from heat, add in the peas, stir, and reserve 1/3 cup of the cooking liquid. Then, drain the pasta/carrot/broccoli/pea mixture + set aside. Meanwhile, make the cheese sauce. Melt butter in medium saucepan over medium heat, then add in the diced onions. Cook until onions are soft and translucent, about 5-7 minutes. Stir in the flour + cook, stirring frequently, for 3 minutes. Whisk in the milk and broth. Bring to a boil, whisking constantly, then reduce heat + simmer for 3 minutes, until the sauce is thickened. Remove from heat, and stir in the cheddar, 1 teaspoon salt + 1/2 teaspoon pepper. Stir until smooth. In a large bowl, stir together cooked macaroni/veggies, reserved cooking liquid, + the cheese sauce. Transfer to the prepared 9×13 baking dish. Top evenly with the bread crumbs. Bake at 350 degrees F for about 20 minutes, until the mac + cheese is hot + bubbling, and the bread crumbs are golden brown. *Note: If your family prefers a stovetop macaroni + cheese instead of a baked version, you can simply omit the breadcrumb topping, pasta cooking liquid, + baking time in the oven. 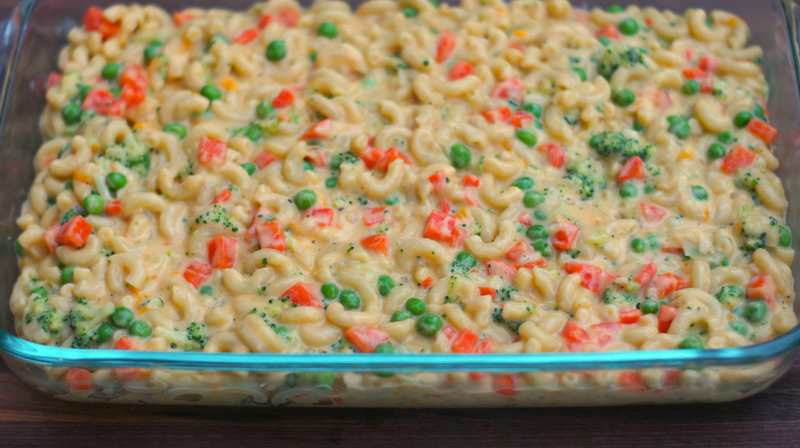 Once you mix together the pasta/veggies and cheese sauce, you can serve it that way instead! ah you must’ve read my mind because today I’m blogging about how tough it has been to feed my daughter! i’ve tried pastina with veggies and parmesean, but definitely going to give this a try also! Your little girl is gorgeous!! 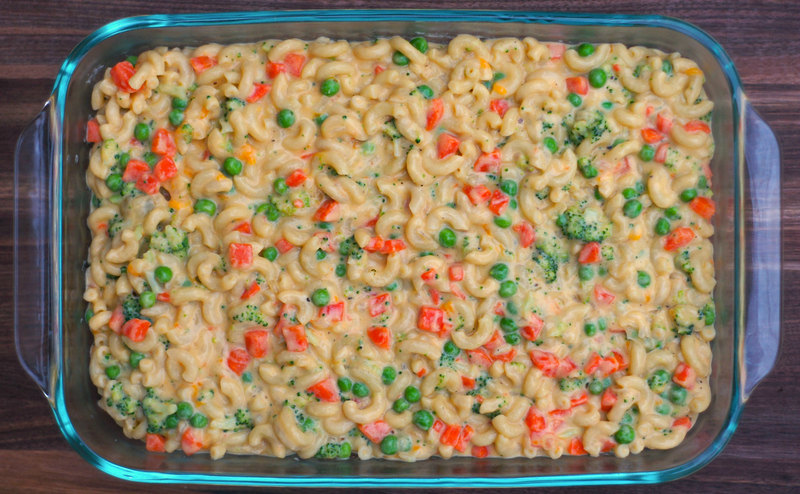 And, great idea for adding in her favorite veggies to the mac and cheese. My “little girl” is now 13, and still LOVES mac and cheese, although not always with veggies. I think feeding a teenager gets trickier, BUT w/ a good, balanced start in childhood, I think it all works out well when they become adults Happy New Year! Looks delicious! But my little eater doesn’t like mac and cheese enough to even give this a try, I’m sure. It’s crazy what she’s missing. My brother didn’t eat mac + cheese growing up (and still doesn’t), and I always think/thought the same – he doesn’t know what he’s missing! The Fearless Bab is absolutely beautiful, and I LOVE seeing her! Also your veg-enhanced mac and cheese looks great. Well done, Mom! This looks so good!! I know it’s for kids, but I want some!! You are such a great mum!! Yay for raising healthy eaters! I love adding veggies to my mac n’ cheese to make it more nutritious. It’s great that your daughter likes it, too! A definite win! Such a great way of packing vegetables right into the meal! And how awesome is it that both adults and kids love it? There’s nothing that says comfort food like homemade mac and cheese. My little man loves mac and cheese! Unfortunately, he’s on to me and would pick out every single vegetable before eating this. The rest of us would gobble this up! Oh wow, she is such a toddler already, where’d your baby go?! This sounds like a great weeknight meal everyone would love. Lovin this healtier version of mac and cheese….